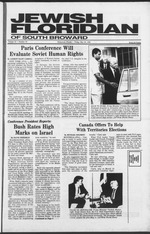 human rights accords in 1975.
vel, equal rights and religion. the White House last month. tions and the designated U.S.
a fall several days earlier. (AP/Wide World Photo). ment of Israel ask for it,"
over, and we don't like them." Ismel. A similar demonstration was held in Philadelphia, as well. shortly after the Bitburg visit. its new officers for 1989-90. Raton and West Palm Beach. start to the new fire season. Seth enjoys drama and sports. the beginning of World War II. want of a two-thirds plurality. Irene Gruber, left, and Alice and Philip Moore, right. the Col. Mitchell Wolfson, Sr.
tion Organization as a member-state. expulsion, of the Jewish state from that body. his use of familiar rhetoric. of the State of Israel is null and void. A Compulsion to Repeat the Past? to Treasury officials when it was announced. measures taken by the government. month. Inflation is now running at an annual rate of 9.4 percent. the prices of clothing, footwear, fruits and vegetables. On Holocaust Remembrance Day, President George Bush met at the White House with U.S.
ing, 'Give this man a chance. the cause of peace," he said. ber library, dedicated in 1983.
as mercury, lead and arsenic. thrown out of the country. the issuing of the cards. Deals on rental cars-3 days free in London. ing his all too short tenure. to stop their supplies to Israel. "But the future is very clear. which George Bush can build. 'support of the State of Israel. duties, it was announced here. ever from a Soviet republic. its request from last year. better than The Florida Club. A View of the Club and the Lake. AN ANTI-PLO VOTE. John Bolton, above, the U.S.
as a member state. (APIWide World Photo). No. Miami Beach. Services were held. of Hollywood; and brother, Arnold. inception nearly 70 years ago. cal liberties, and social justice. sible for the common welfare. Guest speaker Dr. Abraham For information: 941-0522. Jeriff. Funeral services were held. wife, Matty; daughters, Jane Roth of No. eral services were held May 17.
held Friday, May 26, 5 p.m.
in the main sanctuary. Dr.
Joel Fass, will be celebrated. services are held 7:30 a.m.
a.m.; evenings at 5:30 p.m.
bat service will begin at 8 p.m.
which begins at 9 a.m.
chapel at 8:45 a.m. and 5 p.m.
maariv services at 8 p.m.
ter in located at 416 NE 8 Ave.
Mr. and Mrs. Lawrence G.
sistently makes the honor roll. of the Temple Youth Group. and he won a special award. includes the buffet and a drink. erate elements in the party. Sharon, Shamir will still com- membership exceeds 2,000. 27 Maple Terrace, Monsey NY 10952. Competitive tar and ncotine levels reflect the FTC melhod.